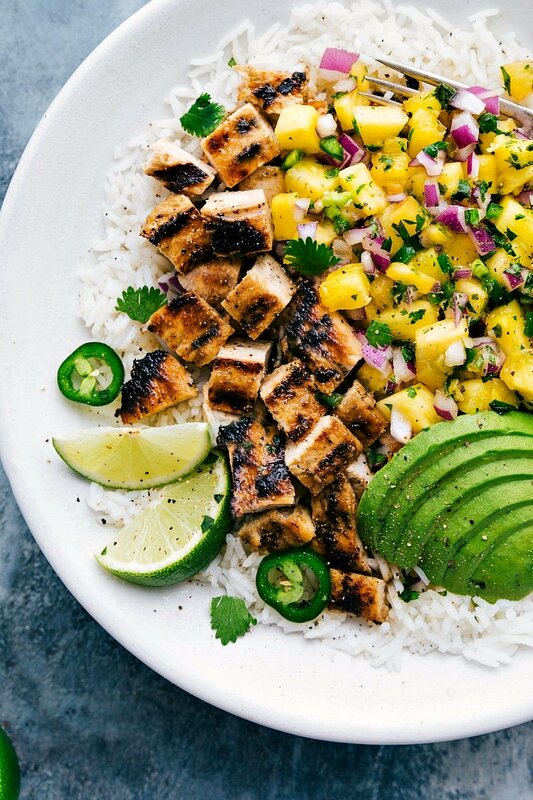 Delicious marinated chicken with a simple cilantro pineapple salsa. This pineapple chicken is easy to throw together and mega flavorful! Pair this pineapple chicken with coconut lime rice or cilantro lime rice for a complete meal. You can also serve some roasted asparagus or roasted brussel sprouts on the side if you’re feeling ambitious! 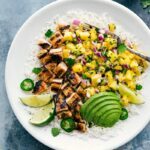 With a sweet and slightly zesty chicken marinade, smokey and succulent pineapple salsa, and a creamy avocado bringing everything together — THIS is one of my all time favorite meals! It comes together nicely, is easy to make, and best of all it’s a complete party-in-your-mouth of great flavor and good textures! This recipe requires relatively few ingredients, so the ingredients and the way you prepare them matter. While I highly recommend grilling this meal, a grill pan also works great. And in a pinch I’ve included oven and skillet instructions. Enjoy! Whisk together all of the pineapple chicken marinade ingredients: this marinade is the perfect complement to fresh grilled pineapple! It’s slightly sweet & zesty thanks to the coriander, cumin, and honey. Reserve some of this marinade to brush over the chicken as it grills. Marinate: place the chicken in marinade and chill in the fridge for at least 30 minutes and up to 6 hours. We don’t marinate longer than that as the acidity from the lime begins to “cook” the chicken. Baste: as you cook the chicken, brush it occasionally with the reserved marinade mix. This is going to amp up the flavor! 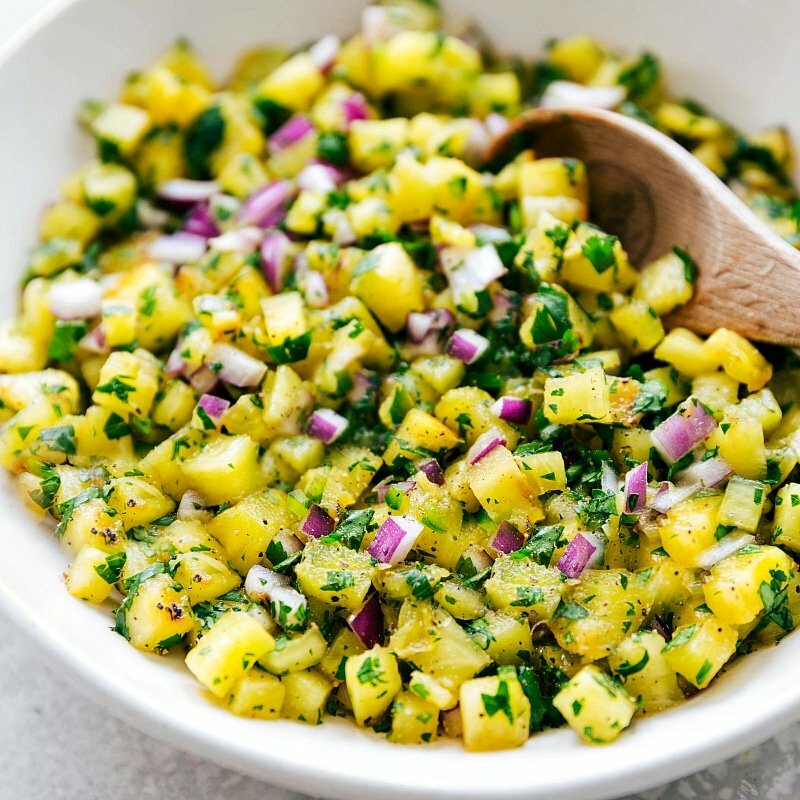 Pineapple chicken salsa: while the chicken is cooking, it’s the perfect time to whip together the salsa. The salsa requires few ingredients but packs a huge punch of flavor! To ensure it’s as flavorful as possible, make sure you get a really good and ripe pineapple! Jarred garlic: yes, real garlic is better, but in a marinade you can’t tell that much of a difference. Jarred garlic will make the marinade fast and simple. Juicer: this recipe requires quite a bit of fresh lime juice (which means you know it’s going to be delicious ;)), so invest in a good juicer or citrus reamer. You don’t need anything special or crazy expensive; this one is pretty cheap and a great investment if you juice a lot of citrus. If grilling, generously oil your grill grates. I do this by rolling up a few paper towels, drenching them in oil (I use canola or vegetable), and using tongs, rub the drenched paper towels along the grill grates. Doing this will contribute to a beautiful sear, and ensure the chicken and pineapple doesn’t stick to the grates. As the chicken is cooking, brush the reserved marinade on the meat. Doing this will enhance the chicken’s flavor. Once it’s finished, let the cooked chicken rest, tented with foil, for 5-10 minutes before cutting in! Once it’s rested, thinly slice or chop it. I prefer chopping the chicken as it mixes better with the salsa, avocado, and rice. For the best flavor, grill the pineapple. 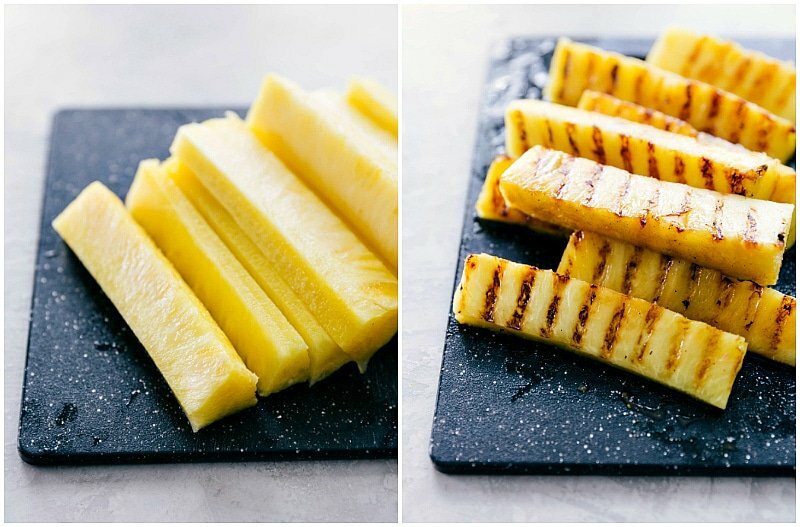 While this is optional, grilling the pineapple brings out the absolute best flavor (and it doesn’t take long to do!). It makes the pineapple more juicy, flavorful, and sweet. One of the things I love about this pineapple chicken is how easy it is to adjust it to your personal preference or desired cooking method. Below are a few ideas for making the dish healthier and how to cook it with alternate methods. Healthy pineapple chicken: as written, this dish is exceptionally healthy! To make it even healthier, serve it over quinoa, brown rice, or another similar whole grain. Fresh pineapple chicken recipe: while you can use canned pineapple with this dish, opt if possible for fresh; the flavor difference is amazing! Here are a few tips to finding the perfect fresh pineapple. 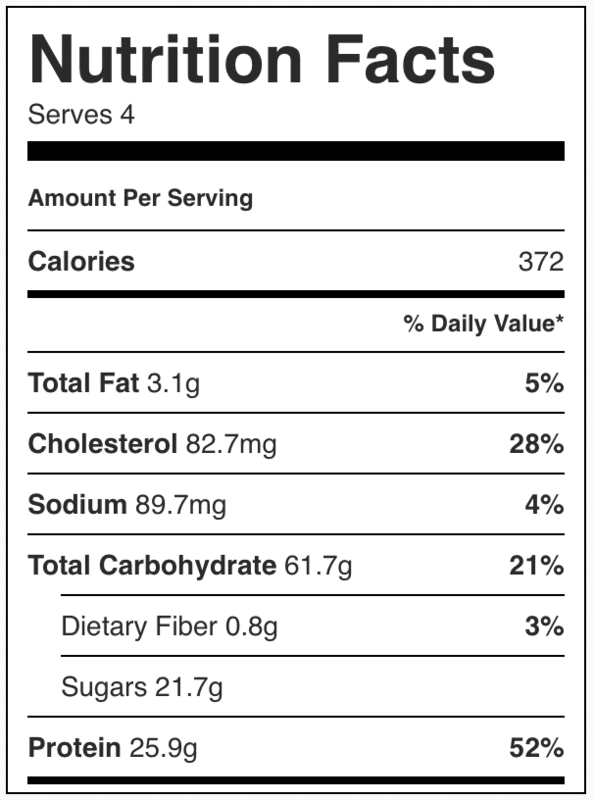 If using canned pineapple, make sure you are selecting pineapple that isn’t canned in a sugary substance. Baked pineapple chicken: this recipe can be baked instead of grilled! To do so: preheat oven to 425 degrees F. Place chicken on a baking sheet lined with parchment paper. Bake for approximately 18 minutes, flipping the chicken halfway. Remove from the oven, and loosely cover sheet pan with foil. Let the chicken rest for 5-10 minutes. Serve mango salsa over the baked chicken! Sauteed pineapple chicken: this recipe can be sauted instead of grilled! To do so: heat 1 tablespoon oil in a sauté pan over medium-high heat. Add chicken breast and cook for 4-6 minutes per side until the chicken is cooked through and the juices run clear. As you saute the chicken, brush it generously with the reserved marinade. Transfer the chicken to a clean plate, and loosely cover with foil. Let the chicken rest for 5-10 minutes. 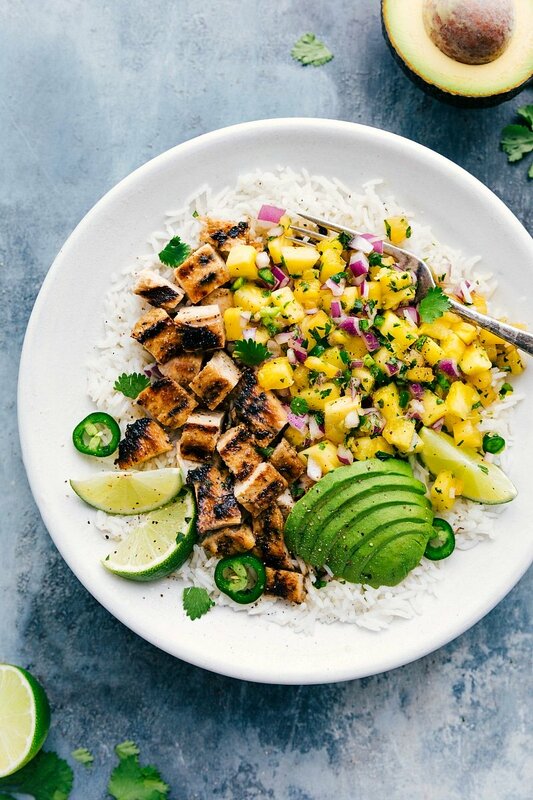 Serve mango salsa over the sauteed chicken! Pineapple chicken in the slow cooker: I wouldn’t recommend making this recipe in a slow cooker, however, you can cook chicken breasts in a slow cooker, shred the chicken, and then serve the delicious salsa right on top! Trim the chicken breasts of fat and then slice large breasts evenly in half widthwise. Using a meat mallet or the bottom of your fry pan, pound breasts to even thickness (you don't want the meat super flat, just even in thickness). Place the prepared chicken in a large ziplock bag and set aside. In a small bowl whisk together 1/4 cup olive oil, 1 teaspoon lime zest, 1/4 cup freshly squeezed lime juice, minced garlic, honey, cumin, coriander, and salt + pepper (I use about 1/2 of each; add to preference). Once the mixture is well combined, remove 3 tablespoons of the mixture and reserve in the fridge for later. Add the rest of the marinade in the bag with the chicken. Seal the bag and then knead with your hands to ensure all of the chicken is well coated. Place in the fridge and marinate for at least 30 minutes and preferably 2-3 hours. Don't marinate longer than 6 hours (acid from lime begins to "cook" the chicken). Preheat a grill or grill pan to medium-high heat (about 400 degrees F.) Generously oil the grill (I drench a roll-up paper towel in vegetable oil and, holding it with tongs, rub it over the grill grates. Don't skip this step.) Start by grilling the pineapple (Note 1) so you can work on the salsa while the chicken cooks. Rub about 1-2 teaspoon(s) vegetable oil over all sides of the pineapple. Cook for about 2-3 minutes per side or until lightly charred (or grilled to your liking). Remove to a plate to allow to slightly cool before dicing. 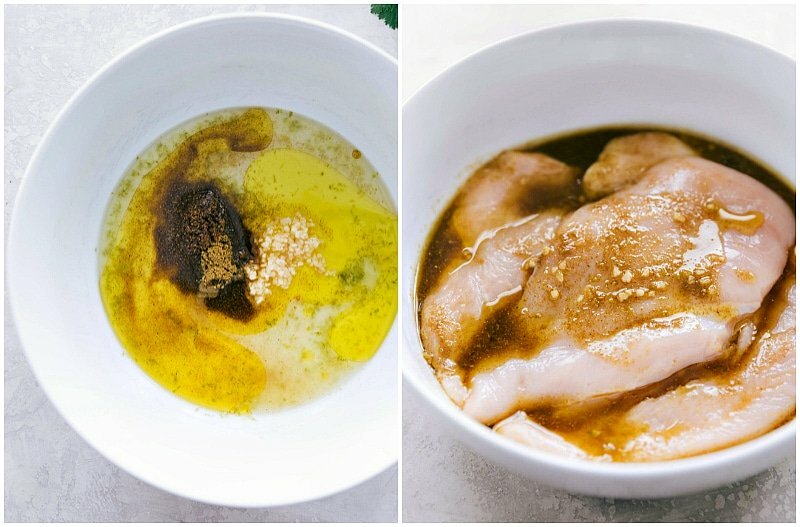 Remove chicken from marinade and discard any remaining marinade. Grill the chicken (on the other half of the grill) turning once halfway through grilling, about 4-6 minutes per side (until the thickest part of the chicken registers 165 degrees F and juices run clear). Baste the chicken with the reserved marinade as you grill and after flipping. Transfer the chicken to a plate and cover for foil. Allow the chicken to rest for a few minutes (covered with foil) so the juices can re-distribute. Slice thinly or chop into bite-sized pieces. While the chicken cooks, prepare the salsa! 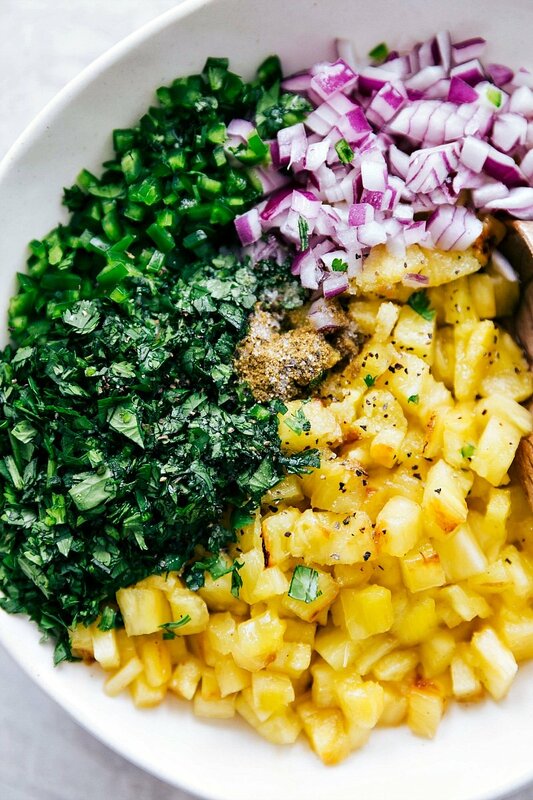 Dice the grilled (or fresh) pineapple, dice the cilantro, dice the jalapeno, dice the red onion. Toss everything together in a large bowl with the freshly squeezed lime juice, cumin, and salt and pepper to taste. I add about 1/4 teaspoon of salt and 1/8 teaspoon pepper, but add to preference. Gently toss together, taste, and then adjust seasoning if needed. Serve spooned generously over the grilled chicken.